It felt pretty glamorous to be a DS editor this weekend. We all dressed to the nines for the 2014 Capezio A.C.E. (Award for Choreographic Excellence) Awards—one of the highlights of the Dance Teacher Summit, an impressive annual extravaganza presented by our friends over at Dance Teacher magazine. Fellow editor Nicole and I were both first-timers at the event, and we didn't know quite what to expect. Man, were we in for a treat. The show featured the works of 19 budding choreographers, all finalists vying for this year's big prizes. The winner receives a $15,000 production budget for their very own, evening-length show in NYC, produced by Break the Floor, while first and second runners-up win $5,000 and $3,000 production budgets, respectively. So naturally, all of the choreographers brought their A-games. Honestly, we haven't been able to stop talking about it since. Nicole and I sat down this morning to debrief. Maggie: So let's talk Saturday night. How would you characterize the overall vibe of the evening? Nicole: Super high energy. It was so cool to walk into a ballroom full of dance lovers and professionals, all on the edge of their seats waiting for the show to begin. Maggie: I completely agree. It was awesome to see that high energy carry into the choreography—especially in the musical theater pieces. Derek Mitchell's We Both Reached for the Gun and Caleb Teicher's A Little Moonlight didn't skip a beat. So much fun. Nicole: The contemporary pieces were also really strong. I especially enjoyed the complex partnering in Jessie Hartley Riley's No Need to Fear. Our 2014 CMS finalist Alyssa Allen ROCKED that piece. Maggie: And what about Jake Tribus and fellow CMS finalist Sarah Pippin in Kristen Russell's The Cave? Talk about a feel-good piece. 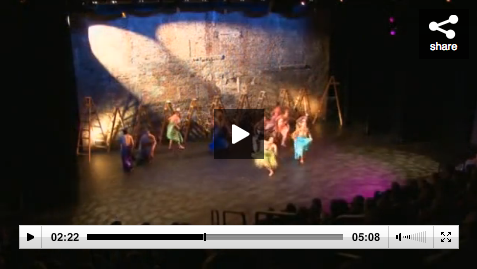 I loved the sweeping movement across the stage—it felt like they were frolicking in a field. Nicole: Totally. But let's talk about the big winners of the night. Second runner-up Emma Portner's Let Go, Or Be Dragged—I really appreciated the way she incorporated elements of street dance in a contemporary piece. Plus, the super-solid ladies partnering was quite impressive. Portner entered the competition with another piece: Come Back, Let Me Under! Maggie: I agree. I thought her movement quality was especially unique. I applaud her dancers for pulling off such complex, idiosyncratic movement with complete precision. Nicole: First runner-up Cherrise Wakeham's She was completely different but equally impressive. It was romantic and gentle and lovely. Maggie: And those skirts. Where can I get one? But the big winner of the night was Talia Favia. Her piece, The Difference Between Action and Words, was extremely powerful. 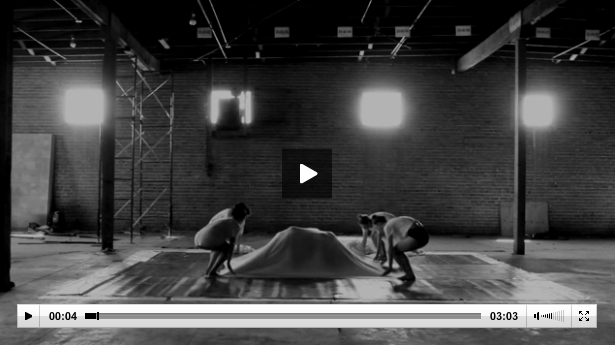 The dancers used tape to convey the feeling of being silenced or controlled. Nicole: The dancers just went for it. It was probably the most technically demanding choreography of the evening. Shout out to January 2012 cover guy Chaz Buzan, who was a real standout in the piece. Favia entered the competition with another excerpt: The Difference Between Sinking and Drowning. Maggie: Chills. Saturday night also featured excerpts from last year's runners-up: Lindsay Nelko, Jacob Jonas and Andre Kasten. We really saw how much development can happen in a year! Nicole: Such a cool part of the evening. I'm really looking forward to seeing more of them during this week's Capezio A.C.E. Awards Winners Festival!